So when I heard that Boston Public Library’s Central Library had finally pulled its bust of the author from a basement crate and placed it out among the shelves, of course I made a special trip to go see it. But I had other reasons. In October of 2014, I attended the bust unveiling. The sculpture was created by Bryan Moore, who I had featured in Poe-Land because of the H.P. Lovecraft bust he created for the Providence Athenaeum (it makes sense in the book). 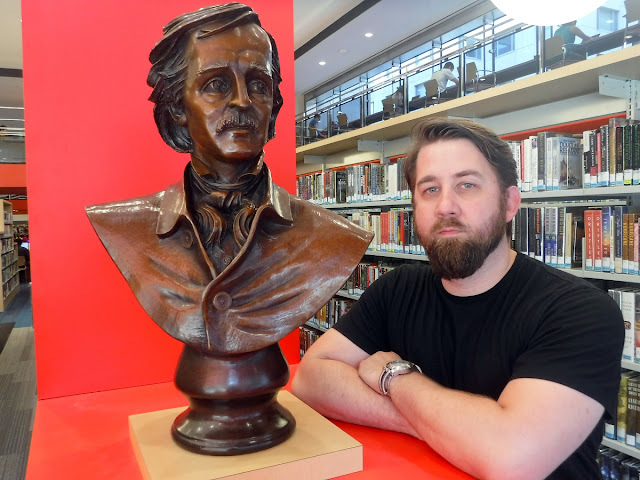 You can see pictures from Poe bust unveiling and read all about the backstory here on OTIS. The Poe bust was slated to be displayed in an area of the library that was undergoing a complete renovation. So just as soon as its black drape was lifted, it was shoved into the darkness of a closet somewhere, hopefully not to be lost. 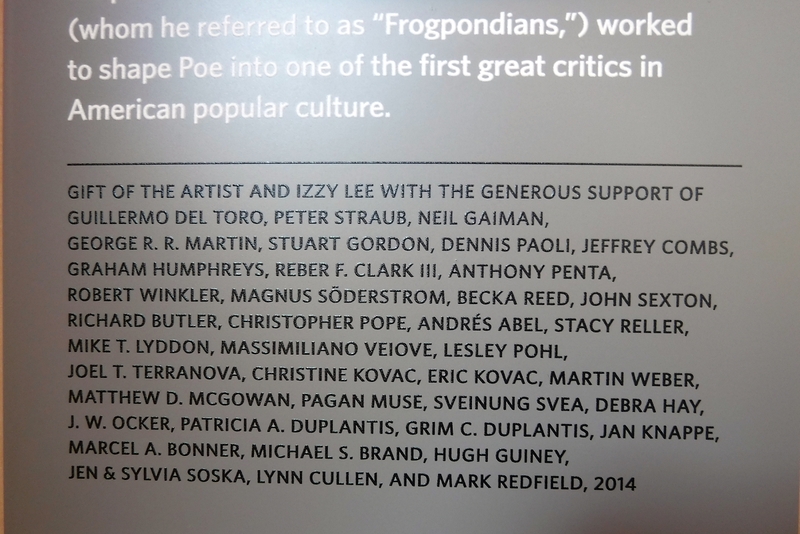 Both the Lovecraft bust and the Poe bust were Kickstarter projects, and I happened to contribute to the latter and got my name on a plaque along with other of the supporters that was attached to its display stand. Which meant that now that the bust was out, my name was enshrined in the Boston Public Library. The BPL’s Central Library is on Copley Square, right near the Boston Marathon finish line, and it’s made up of two connected buildings. One is the McKim Building, which is all ornate sculpture and marbled halls lined with historic paintings. 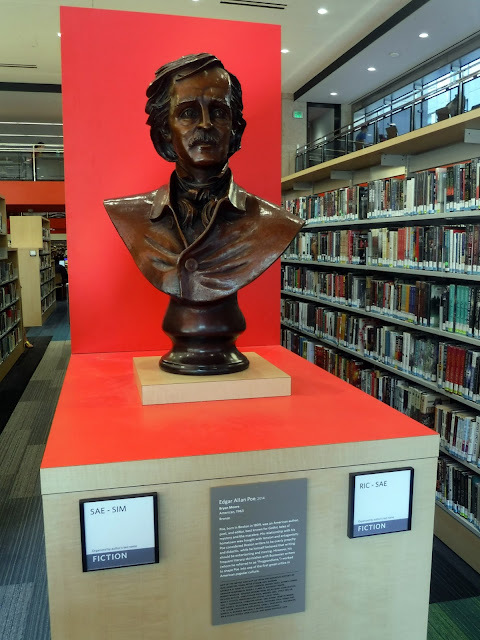 The Poe bust was debuted in one of the rooms here (and his name is inscribed on the side of that building’s exterior, along with other giants of literature). The Johnson Building is the second building, and it is here that Poe resides now that the building has been renovated. The Johnson is more modern place and less imposing than the McKim. 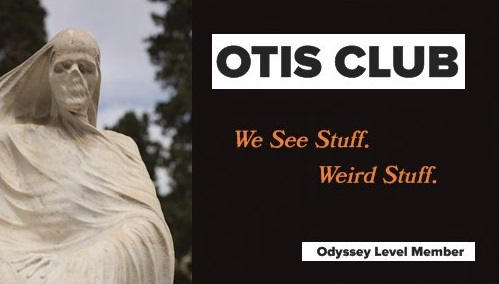 It didn’t take too long for me to find the bust. 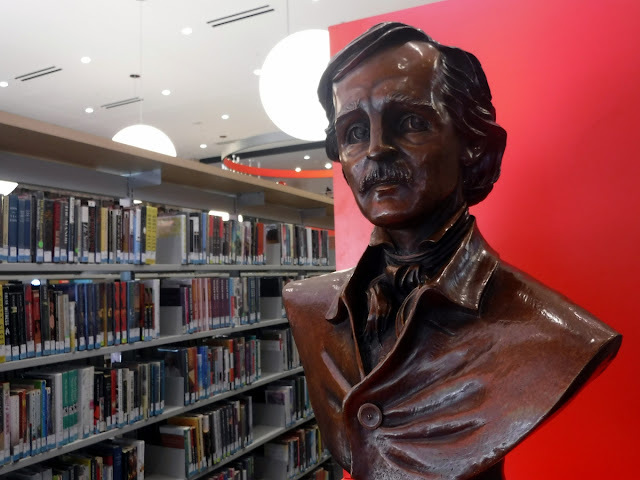 Poe’s on the first floor, in the fiction section. 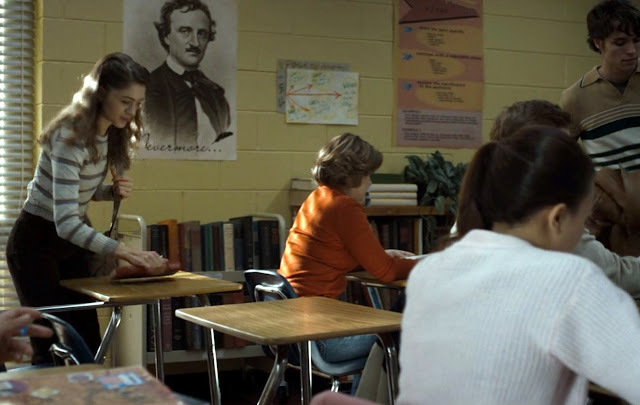 He’s on a cut-out at the end of a shelf, its orange-red side backdropping the dark bronze bust. Poe faces a window that looks out at ground level of Exeter Street, which means you can see him from the sidewalk. There’s even a table and chair there between him and the window if you want to read some Poe while being stared at by Poe. It’s extremely accessible. You can get right up close to it, see his hubcap-inspired eyes, and even get a clear view of Moore’s signature coded message on its back. As to the plaque, the original bronze one had been replaced with a more modern, art museum-type placard. 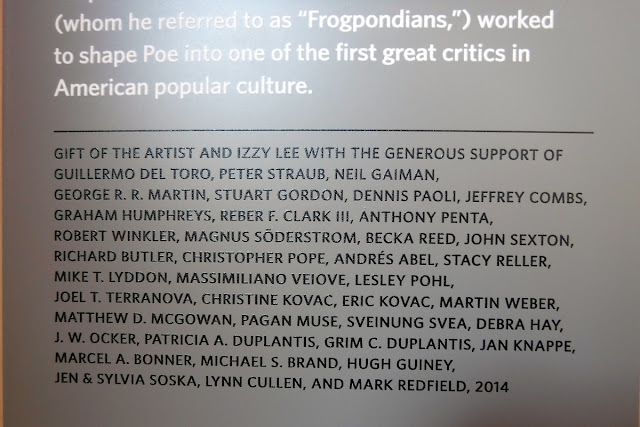 It gave information on the bust, on Poe, and then at the bottom, in small print, the project supporters, including Peter Straub, Neil Gaiman, Guillermo del Toro, and some low-list schlub named J.W. Ocker. So that means my name’s enshrined in the BPL twice, once on this placard and once on a plaque wrapped in brown paper in a storage drawer somewhere. But the important thing is that now that this bust is on public view, between it and the Poe Statue in Poe Square, there are two places you can say hi to Poe while visiting Boston. And I encourage you to do so. As to the sculptor himself, Bryan Moore has more horror heads planned for the world. He’s currently at work on a bust of none other than Bram Stoker for the Dublin Writer’s Museum across the ocean in Stoker’s birth city. You can read all about that project here. Meanwhile, I’ll continue my neverending quest to see every new Poe development that I Poe can.